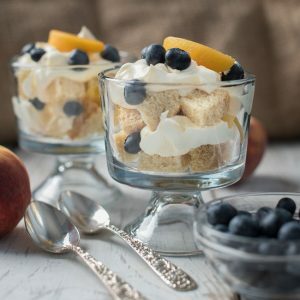 This peach blueberry trifle dessert is a really really simple and enjoyable dessert, especially if you have some leftover pound cake laying around. But be careful about the layers you choose…you don’t want to pull a Rachel. 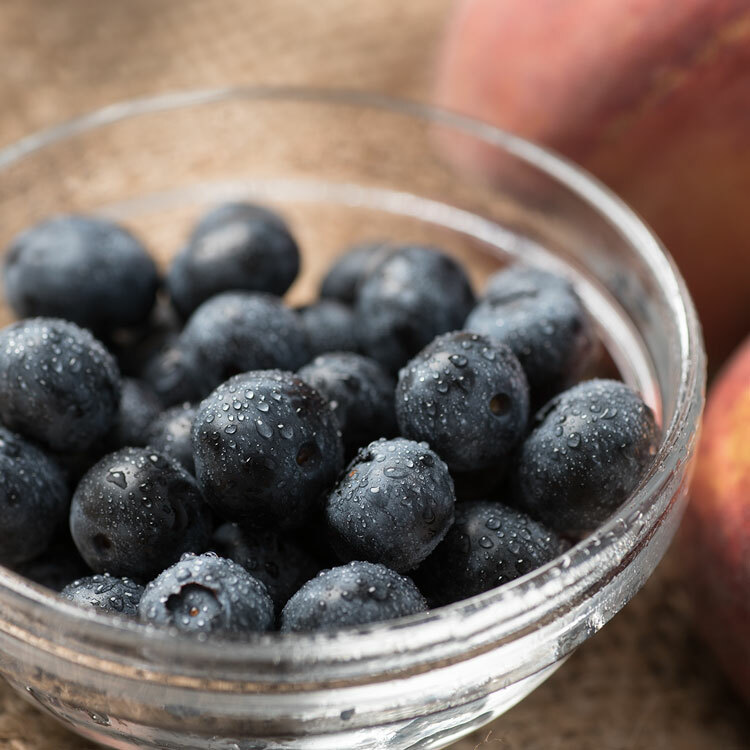 Ah, blueberries and peaches! Two of our favorite fruits. And ones that we think go rather nicely together. 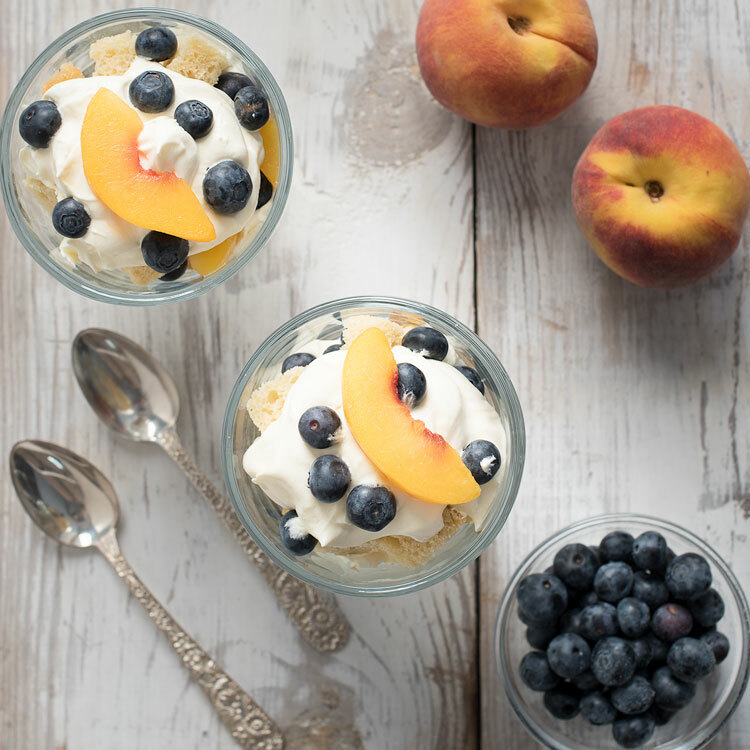 They were an easy pairing choice for this Peach Blueberry Trifle Recipe. I can’t wait for summer to have fresh blueberries and peaches available to make this! And, who doesn’t love a good trifle? It is a dessert that can be enjoyed by all. Well…probably…if you don’t pull a Rachel. If you’re wondering how to make trifle dessert, it’s not hard. Basically you are just layering together different ingredients often alternating a pudding or custard-like layer with that of fruit or something else. Just be careful to not get your layers mixed up. In an episode of the tv show Friends, Rachel tries to make trifle, but accidentally combines the recipe for an English Trifle with a recipe for a Shepards Pie! Ladyfingers, jam, custard, raspberry, beef sauteed with peas and onions…those are some interesting trifle layers. Unfortunately, it was not enjoyed by all, only by Joey who will eat anything. We weren’t thinking quite so outside the box with our Peach Blueberry Trifle Dessert since our kids tend to be a little more finicky than Joey Tribbiani. Fruit trifle seemed like a safer play. And we thought peach and blueberry trifle would make for an interesting combination without sending our diners fleeing from the table. It is a slightly more traditional pairing compared to jam and raspberries with beef, peas, and onions. But, to each their own. Trifle can be made with lots of different layer combinations. Mini Baileys Chocolate Cheesecake Trifle – No bake cheesecake, dark chocolate, Baileys, Oreo cookies…I’m sold. This Mini Baileys Chocolate Cheesecake Trifle from Life, Love and Sugar is going on my list. 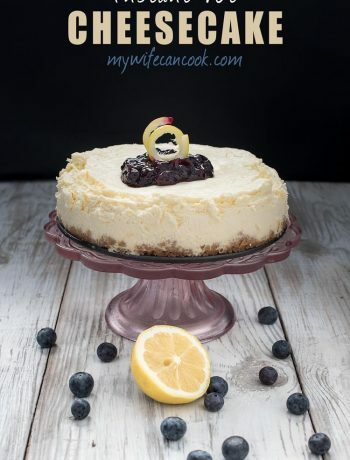 Tres Leches Coconut Cake Trifle – We’ll try anything that features coconut and the Tres Leches Coconut Cake Trifle which is also described by Willow Bird Baking as a “Milk Soaked Coconut Love Bomb” has peaked our interest. 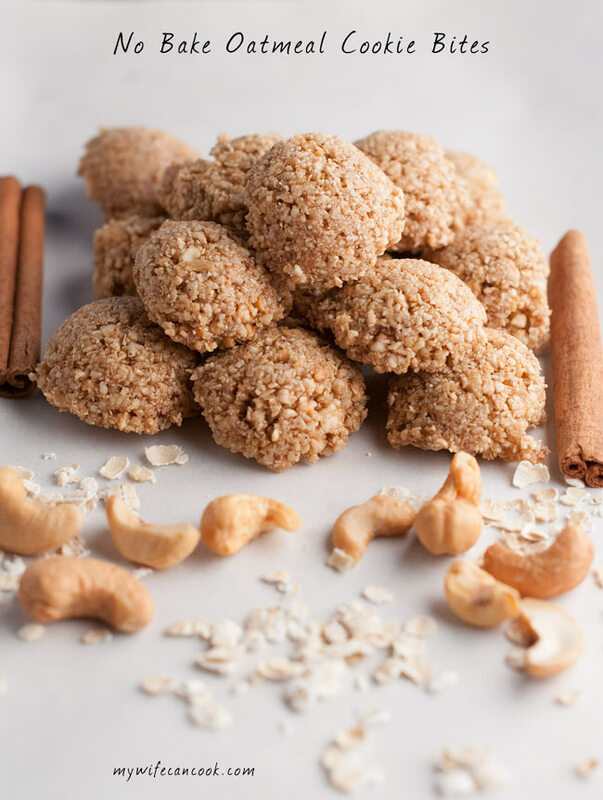 It looks like the recipe is a bit of a challenge to execute, but you should never let a good challenge stand in your way when dessert is the prize. Turtle Cheesecake Trifle – Layers of caramel, chocolate, pecans, no bake cheesecake, and pound cake. Let’s see…..check, check, check, check, and check! This Turtle Cheesecake Trifle from Mom on Timeout is speaking a flavor language that’s music to our ears. 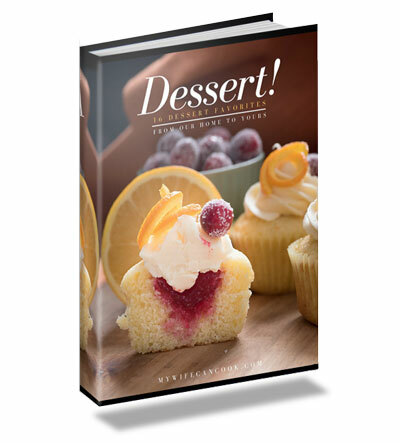 Cranberry Orange Cream Trifle – We figure we have to try this Cranberry Orange Cream Trifle from Chef in Training because it features the same Cranberry and Orange flavor pairing that we tried and loved with our own Cranberry Orange Cupcakes. This looks like it would be another great holiday dessert. Chocolate Toffee Trifle – We read “mouth-dropping” and “insanely easy” and we knew this Chocolate Toffee Trifle from One She Two She needed to be added to our dessert list. 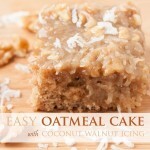 Who doesn’t like making a dessert that earns wows, but is secretly easy to pull off. Plus, if you’ve read about our love affair with Heath Bar Cake you know we think chocolate cake and English toffee is a winning combination! We’ve started having our kids help out more in the kitchen. It can be super fun, but also sometimes frustrating and super messy. Since they are just learning it can be hard to find recipes that….hmm…how do I say this tactfully?…. DON’T END IN DISASTER! Don’t get me wrong, disaster is sometimes okay. Kids learn best when mistakes are embraced and they can get in there and get messy. So, there are definitely times for those cooking with kid moments. However, there are times when Mommy is tired and it’s nice to have an easier to execute recipe that’s a little more kid-friendly. 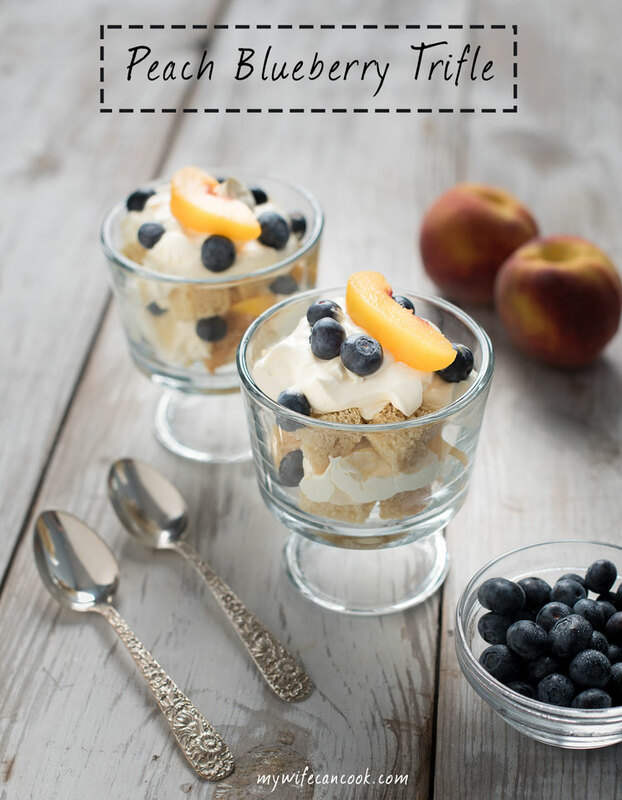 We’ve found that this Peach Blueberry Trifle dessert is a perfect recipe to have the kids help out with. There’s no baking which means no kids accidentally getting burned by hot pans coming out of the oven. There’s no flour involved so no flour for Mommy to clean up off the floor later. And there are no eggs involved! Hey, I like eggs….but let’s just say, when you’re tired and trying to avoid a mess, watching your kids crack eggs isn’t always a favorite pastime. Shudder. 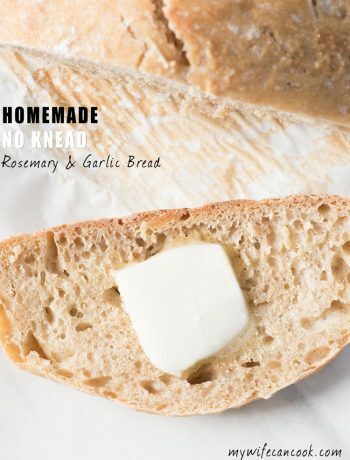 What this recipe does include is easy to execute steps. Fun layers. And flavors your kids will enjoy. Without a huge mess for Mommy. High fives! We’re also promoting shortcuts for this recipe and actually include store-bought pound cake in the ingredient list. But, it’s cool if you want to make one of your own. We actually had just made a pound cake for our daughter’s birthday and so we used leftovers to make this trifle. So, it’s really up to you. Buy a cake. Make one. Use some leftovers you have around. It’s up to you! 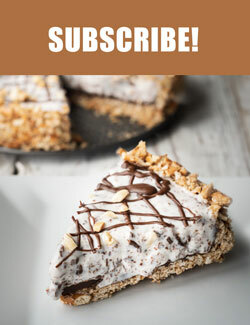 Sometimes we’d certainly promote the freshest and best ingredients, but it’s really the layers that make this dessert work and if you use a store bought cake the chances are no one will even notice. So do what works for you. Nothing wrong with saving time! Aside from the cake, this trifle uses a simple pudding mixture and fresh blueberries and peaches. It’s easy to make, fun, colorful, and delicious. Give it a try! Whisk buttermilk and pudding together. Fold in cool whip and refrigerate pudding mixture. Cut pound cake into bite size chunks. Divide cake bites in half and arrange in the bottom of 12 individual trifle or dessert bowls. Top the 12 individual serving dishes with half the pudding mixture and sprinkle half the fruit on top. Top with remaining cake bites, then pudding mix, then fruit.